The Bollywood shehenshah recently visited Bollywood’s Badshah, after the latter got operated for a shoulder surgery. Big B wished to see SRK at the hospital itself but when he came to know the discharge of Shah Rukh, he indeed planned to meet him at him home, “Mannat”. 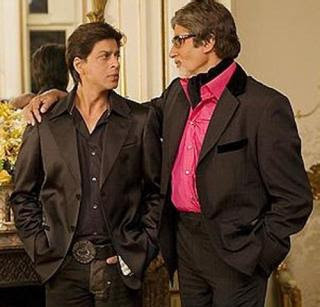 Amitabh Bachchan wished Shah Rukh Khan a speedy recovery and gave him many suggestions to indulge in less activity to give proper rest to his shoulder. The warm host Gauri Khan served the guest and SRK with green tea and vegetarian snacks. Amitabh also chatted with Gauri’s mother who was present at “Mannat”.